Some have called Sam Slater's mill the birthplace of the American Industrial Revolution. During the first 30 years of the 1800s, American Industry was truly born. Household manufacturing was almost universal in colonial days, with local craftsmen providing for their communities. This new era introduced factories, with machines and predetermined tasks, producing items to be shipped and sold elsewhere. 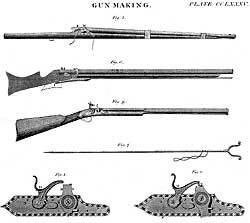 Eli Whitney's development of the interchangeable part began by revolutionizing the arms industry, but ended up transforming the face of manufacturing in the United States. In the iron industry, Pennsylvania's furnaces and rolling mills were fast supplanting small local forges. In 1804, Oliver Evans of Philadelphia developed a high-pressure steam engine that was adaptable to a great variety of industrial purposes. Within a few years it powered ships, sawmills, flour mills, printing presses as well as textile factories. In 1798, Eli Whitney, who had invented the cotton gin in 1792, contributed one of the most important elements of the industrial age. He came up with the idea of making guns using interchangeable parts. The idea of interchangeable parts had been raised in Europe, but it took an American to successfully commercialize the concept. 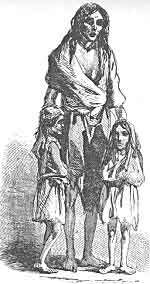 A potato famine during the mid 1800s brought many Irish immigrants to American shores. Here, they played a huge part in the Industrial Revolution as well as Westward Expansion. The concept was seized by industry after industry. Canal and railway construction played an important role in transporting people and cargo west, increasing the size of the US marketplace. With the new infrastructure even remote parts of the country gained the ability to communicate and establish trade relationships with the centers of commerce in the East. The new industrialization was very expensive. Out of the need for money grew the corporation. Chartered under state laws, corporations could accumulate capital from as many investors as were interested in them, each of them enjoying some stock or stake in the corporation's success. There was no limit to how much investors could earn, yet each with "limited liability" whereby they were financially responsible for the corporation's debts only to the extent of their investment. Yet, the Industrial Revolution would not have been possible without one further ingredient — people. Canals and railways needed thousands of people to build them. Business schemes required people to execute them. The number of projects and businesses under development was enormous. The demand for labor was satisfied, in part, by millions of immigrants from Ireland, Germany, and elsewhere. As is often the case when there is a mass immigration, there was a great deal of resistance. Old and new political parties took strong positions on the rights of immigrants. Ultimately these positions hardened, leading to major political changes in America. From the misty fields of the Irish countryside to the sweeping plains of Oklahoma during the land rush, Far and Away starring Tom Cruise and Nicole Kidman traced the troubles and triumphs of two Irish settlers during the Industrial Revolution. The discovery of gold in California lured Chinese as well as Easterners to the hills of California. When reality fell short of promise, the immigrants turned to employment on the railroads.